Reethika Precision Engineering is a registered company in Chennai, India. We maintain the highest quality at all times. The total customer satisfaction is our primary motto. 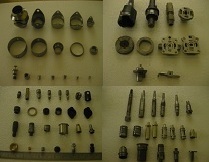 Reethika Precision Engineering is proud in supplying high precision CNC Sub-con Machined Components. We would like to work with customers hand-in-hand, understanding your problems and providing an optimal solutions. We are basically mechanical engineers having sound knowledge in manufacturing industries. We can create process setup sheets and manufacture Automobile, Aerospace and High Precision Industries components with at most quality. The manufacturing facility is located in Chennai, India. The plant is equipped with well-maintained, high-accuracy and new machines in a controlled environment. Please get in touch for your immediate queries on Precision CNC Machined Parts!